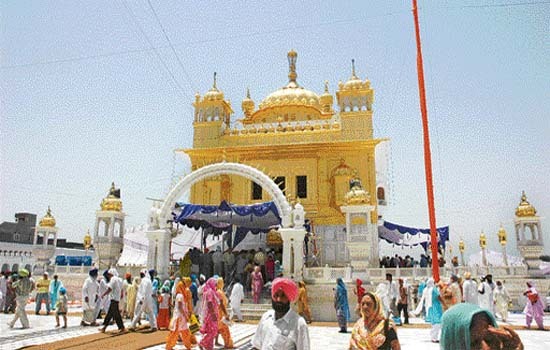 SACRED SITE: Gurdwara Tarn Taran Sahib is visited by hundreds of pilgrims every day. IN my early days in the profession I used to write a fortnightly column, ‘Window on Latin America’. Lest the readers should get a wrong impression, it is a continent I am yet to visit. It was mere happenstance that when militancy was at its peak in Punjab, I wrote most of the editorials on the subject for the paper I worked for those days. Otherwise, my acquaintance with Punjab was limited to a brief visit I made to a village near Mandi Gobindgarh as part of a non-official, two-member committee to inquire into an incident of desecration of a religious place, which we found had little to do with militancy. On Sunday morning when I left for Tarn Taran from Jalandhar via Kapurthala, the names of many of the places we passed through were, therefore, quite familiar to me. After all, this was the epicentre of militancy from where many of the militants hailed. Many macabre incidents warranting editorial comment had happened in this area. Small wonder that a large number of boys who "disappeared" and whose cases have been documented by human rights organisations belong to Tarn Taran and its neighbourhood. But at an intersection, just two km away from Kapurthala, a well-dressed young man our driver approached for route guidance had not even heard of Tarn Taran Sahib. Worse, Khadur Sahib and Amritsar were names that sounded Greek to him. "He must be an agricultural worker from Uttar Pradesh or Bihar on an outing", concluded the driver. 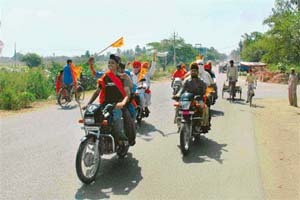 We no longer had to seek any guidance as a boisterous group of motorcycle-borne Sikh pilgrims holding aloft Sikh flags passed by. "Raj Karega Khalsa" shouted the boys as we followed them at a distance. We presumed that on the first Sunday after the 400th martyrdom day of Guru Arjan Dev, they were on their way to Tarn Taran, the brand new district of Punjab, to pay homage to the Guru, who founded the city over four centuries ago. As they zigzagged at breakneck speed, we hoped they would not become martyrs of road safety. What if they were going to some other gurdwara? We crosschecked the route. Yes, we were on the right road. The traffic was sparse except for the vehicles going to gurdwaras. Sunday may not be sacred for the Sikhs but it is on this day that gurdwaras get the maximum gatherings the world over. On both sides of the road were vast stretches of paddy fields. Transplantation of rice plants was in progress. It is a labour-intensive job. Most of the workers are from outside the state. They come in droves from places as far away as Singhbhum in Jharkhand and Sonepur in Bihar. At the Kapurthala coach factory, work was reportedly in progress on the specially-designed air-conditioned coaches Railway Minister Lalu Yadav has christened "Garib Rath" for the benefit of these very workers. Call them by any name, they are the ones who sweat it out on the fields of Punjab while the local lads are perpetually looking for visas to go "phoren". Little surprise, we could find hardly any turban-wearing farmer engaged in transplanting the seedlings. They either supervised the operation or drove the tractors to plough the land or soften it. Obviously, the farmers here have not heard the exhortations of the experts that intensive paddy cultivation would only deplete the water resources of the state. Rice requires a lot of water at every stage of growth, except when it is harvested. There has to be a small layer of stagnant water for the rice to sprout and grow. When rainwater is insufficient, farmers are forced to pump water from the underground wells to fill the fields. Naturally, most of the water is evaporated while the water table lowers with each pumping. Crop diversification is a term that is not understood here. When I got down to take a photograph of the transplantation work, the women and children on the field greeted me with great enthusiasm. Probably, they were getting bored and were keen to have a diversion. They stopped their work and wanted me to get closer to them to take their photographs. Our driver and I had to use our persuasive skills to get them back to their work so that they could pose for "natural" photographs. Back on the road, we suddenly found a diversion to Goindwal Sahib. Then and there, we decided to visit the gurdwara. After all, it is associated with Guru Arjan Dev, who was born there on April 15, 1563, as the youngest son to Mata Bhaniji and Guru Ram Das. For convenience, we left the shoes in the car and walked barefoot to the gurdwara. The tiled floors were oppressively hot. After a darshan of the Guru Granth Sahib, we made a hasty retreat to the car. 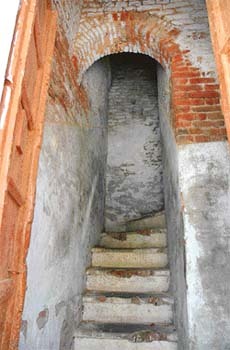 Gone with it was the plan to have a look at the well constructed there by Guru Amar Das with 84 steps to reach the water for bathing. Eventually, it became a major pilgrimage centre for the Sikhs. From Goindwal Sahib, we could go directly to Tarn Taran or via Khadur Sahib, which was slightly circuitous. Why miss an opportunity to visit one of the most sacred shrines of the Sikhs? Off we went to Khadur Sahib. Spread over a vast area, it is one of the most beautiful gurdwaras I have seen. Its origin goes back to Guru Angad Dev, whom Guru Nanak had nominated as his successor, much against the wishes of his own sons. Legends abound about Khadur Sahib, where "langar" was institutionalised and which continues to this day in gurdwaras around the world. 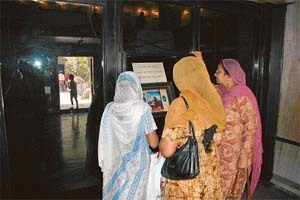 A multimedia museum in the complex provides the visitors a bird’s-eye view of the birth and growth of Sikhism. It also explains how the Gurmukhi script was developed and the role Guru Angad Dev played in it. I made the mistake of taking a photograph of the touch screen presentation viewed by some visitors. A guard cautioned me against taking photographs as it was banned inside the museum. My compliance with his order kindled so much sympathy in him that he told me later that if I wanted, I could take more pictures. I had no inclination to break the ban despite the entreaties of the guard. Thus we knew about Guru Angad Dev’s stay there and how a disciple of his — Guru Amar Das, who later became the third Guru — would go all the way to the Beas to fetch a large pot of water for his use. Today, the brass pot is kept at an elevated place at the centre of a garden from which water flows down ceaselessly, only to be pumped back into the pot to continue the cycle. An old, considerably deep, well of the period is still preserved. Instead of water, it is full of coins and currency notes thrown into it by the devout. Resisting the temptation to have tea at the langar, we moved on to Tarn Taran. On the way, we were stopped at several places by the chabilwalas who would not leave you unless you partook of the sweetened water. At every corner, there was a chabil and every time we had to plead mercy to escape the boys enthusiastically serving the drink. If motorists in the past were terrorised by the militants, their role is performed today by the chabilwalas. After all, how many glasses of sweetened water could you drink during a car journey? All along the road we did not find any institution, educational or otherwise, worth the name. In fact, Tarn Taran is one of the least developed areas in Punjab. The slew of projects Chief Minister Amarinder Singh announced while declaring it the 19th district of Punjab last week will in due course, hopefully, transform it as an educational hub of the state. On the Amritsar-Tarn Taran Road, which has just been named after Guru Arjan Dev, we did not know which direction to take. Guided by the driver’s fifth sense, we reached the residence of the Superintendent of Police, Tarn Taran district. To remove confusion, Tarn Taran had been declared a police district a long time ago. Soon we realised we had taken the wrong direction. A kilometre in the reverse direction, we found a huge festooned gate. Huge arches put up by the Akali Dal, the Congress and sundry organisations with pictures of known and unknown characters dotted the road. Painters were busy giving a new coat to the road divider, a work they should have completed before the CM and Co. had descended on the town. Again, we missed the gurdwara road. The huge tent the Akali Dal had put up for the 400th martyrdom day was being dismantled. We turned back and made a right turn immediately afterwards to take the gurdwara road. The bumper-to-bumper traffic on this narrow road called for expert driving skills. The whole area was swarming with people and there was no place to park the vehicle. We too parked the car on the road and walked straight to the gurdwara. The sight was breathtaking. It has a water tank, which is larger than that of the Golden Temple. 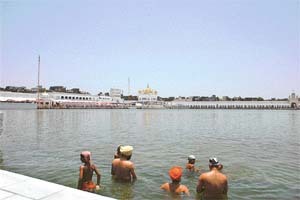 Unlike Harmandar Sahib, the gurdwara does not jut into the water. The floor was so hot that it was difficult to stand and take pictures. But that did not prevent thousands of people from taking a dip in the sacred water and paying obeisance to Guru Arjan Dev, who is also credited with building the Golden Temple. The corridors were long and beautiful. You had to wade through people relaxing on the floor. I looked for a bunga about which I learnt from a feature my colleague Varinder Walia wrote. "The word ‘bunga’ is derived from Persian, meaning a hospice or a dwelling place". I found one. As Walia writes, "Of the total 105 bungas constructed around Darbar Sahib, especially during the Sikh rule, at least 85 have fallen prey to insensitive residents". While devotion to the Guru has not waned, there is no corresponding devotion to heritage. At the langar we were treated to delicious roti, dal, chana and rice. Fortunately, there was no police to challan the wrongly parked vehicles. Another thought occurred. Why not visit the Golden Temple before returning to Chandigarh? Whatever be the time of your visit, a visit to the most sacred pilgrimage centre of the Sikhs is a memorable experience. It gives the visitor an inexpressible experience of peace and devotion. As I completed the visit and marvelled at the peaceful manner in which everything moved in the temple complex without any police presence, I realised that our visit was indeed an unconscious tribute to Guru Arjan Dev, who contributed the most to the Adi Granth and died a martyr at Lahore in 1606.